One of the most iconic science fiction shows of all time, Star Trek first debuted in 1966 and has enjoyed a massive fan base ever since. The original show chronicled the adventures experienced by the crew of the starship Enterprise, which included the now legendary characters James T. Kirk, Spock, and McCoy. Here at Superheroes Direct, we offer fans of Star Trek out-of-this-world collectibles and apparel to help them celebrate their love for the classic series as well as modern films and shows. Shop our apparel, including loungers, robes, and shirts that mimic the uniforms worn by the commanders, scientists, and engineers of Star Trek. We also offer a variety of drinkware, t-shirts, and hoodies featuring iconic logos and sayings. Deck your home out in Enterprise style with our shower curtains, towels, coasters, signs, clocks, and more, while our POP figures from Star Trek The Next Generation make excellent collectibles and gifts. 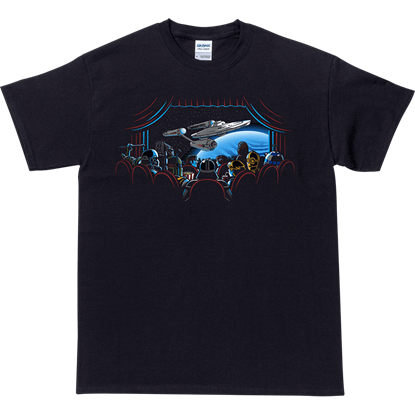 Displaying the widespread love of classic Star Trek, the Movie Watchers T-Shirt is designed with an image of a movie theater which is housing a host of Star Wars characters as they watch the adventures of the USS Enterprise crew. Enjoy your favorite beverage from a collectible glass showing your favorite Star Trek character with this fantastic set! 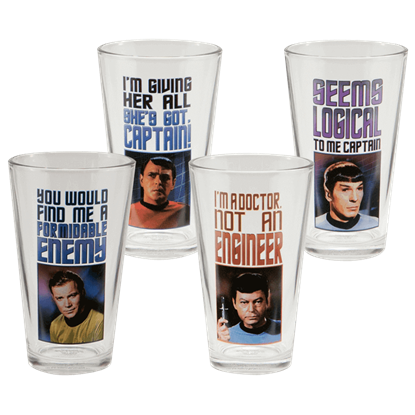 The Star Trek Characters 4 Piece Glass Set displays not only images but quotes from these figures. The starship draws near a planet in an unexplored galaxy. New life forms and civilizations await the crew of the USS Enterprise. Commemorate an exciting voyage into the final frontier with the Star Trek Classic Icons Button Set. The Star Trek universe features a legendary starship with an unforgettable crew. Its dynamic world inspires the imagination. Proudly display the classic symbols of this famous series with the Star Trek Classic Insignia Button Set. Good day to you, Lieutenant. Welcome aboard the finest ship in Starfleet, the USS Enterprise. Your excellent record proceeds you. 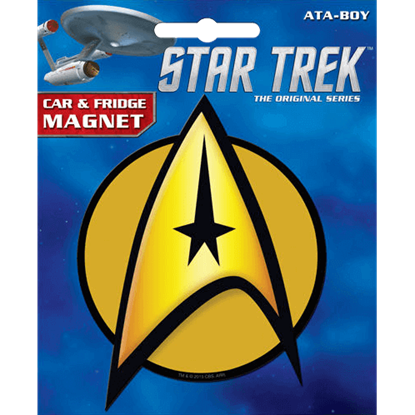 Express dedication to the legendary Enterprise crew with the Star Trek Command Insignia Magnet. For forty years, the USS Enterprise took part in countless military engagements and time-travels as a vehicle for exploration and discovery. 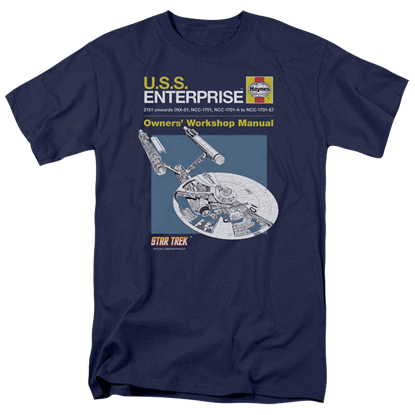 Pay homage to this starship in a unique way with the Star Trek Enterprise Manual T-Shirt. Navigating the frontier of a shadowed hall can be risky. Who knows what strange, new things may lead to a stubbed toe? There is no need to call Scotty, Captain. 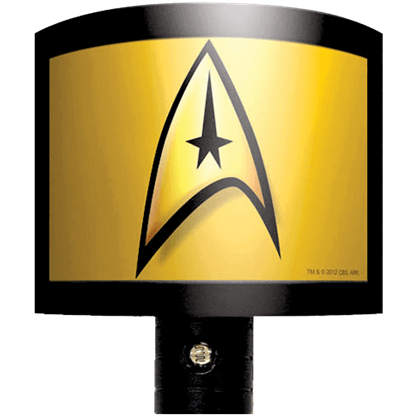 Boldly move through the dark with the Star Trek Insignia Night Light. Fulfill the role of Lieutenant Commander of Communications aboard the Starship Enterprise while exploring the unknown this Halloween. Take the lead as Nyota Uhura, like Zoe Saldana, with the Star Trek Into Darkness Uhura Costume. He is brilliant, ruthless, and he will not hesitate to kill every single one of you. Any fan of Star Trek can take on the persona of the most dangerous adversary the Enterprise ever faced with this Star Trek Khan Uniform T-Shirt! Before heading off to explore distant galaxies, make sure to perform your morning ablutions with a licensed Star Trek TOS towel! 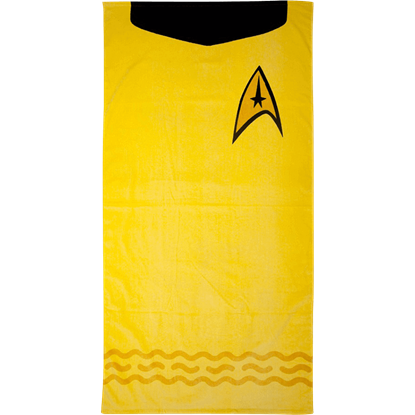 The Star Trek Kirk Uniform Beach Towel features a design inspired by the gold command uniform. It is the showdown of the year 2267! With Captain Kirk in one corner and Gorn in the other, you can place your bets and let the battle begin! 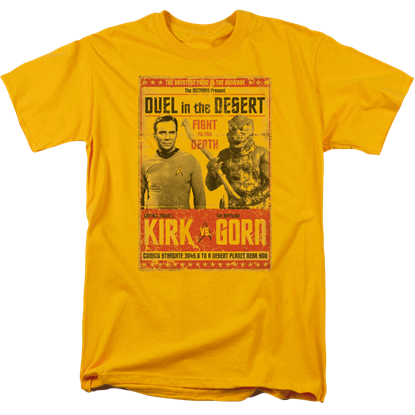 Add some science fiction fun to your wardrobe with this Star Trek Kirk vs. Gorn T-Shirt. Show your pride in the superiority of the Klingon Empire by dressing in the Star Trek Klingon Robe during your moments of rest! This licensed Star Trek loungewear makes an excellent clothing option for new and longtime Trekkies.